I like statistics. I am kind of a geek like that. Which is why I like looking at the stats around visits to this blog; especially the search terms that relate to RM. While perusing the stats I started noticing trends and started to think…so those are the things people want to know about Running Man (at least some of the things 🙂 )! Honestly they are the same things I wanted / want to know too. So I thought I would dig in and try to answer some of those lingering RM questions. Cheers (and let me know if there is anything else you are wondering about RM, I will do my best to find an answer)! Will Yoon Eun Hye ever guest on Running Man? All signs point to No. A definite No. And we have a catch 22. No matter if she is promoting a movie or drama the love line will be inevitably brought up and probably more so than what ever she is promoting. So there really is no good time for her to be on the show. But I appreciate the fact that she cleared everything up- and hate the fact that I feel like there is zero chance she will guest on RM. Does Lee Kwang Soo have a girlfriend? Queue St Agnes and the Burning Train. The answer is no, or at least not publicly (though I have read rumors a plenty linking him to unlikely people, such as Japanese actress Natsumi Abe). He had a girlfriend in the past however they are now broken up (his sadness over the break up was mentioned during episode 38). Which episode is the best / funniest of all time? That is a question that cannot be answered 🙂 I do have my favorites and those I would recommend above others. Check out Lore in Stone Cities guide to the best episodes here. For episode ratings see the RM episode guide. Cheers! 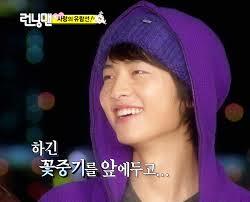 Why did Song Joong Ki leave Running Man? Running Man’s resident Flower Boy threw in the towel (or should I say name tag) during episode 41 in order to focus on his acting career. His schedule, consisting of his acting and his appearance on Running Man, became too much for him (and led to a very teary promise to return a better person). Despite the sorrow of seeing SJK leave his decision seems to have worked out well- JK has had hit movies (Wolf Boy) and hit television shows (Nice Guy) since his departure from RM. Has Lee Kwang Soo served his mandatory time in the military? Yes. Lee Kwang Soo completed his mandatory military service after graduating from high school. While many celebrities may complete their service later- say when they are approaching the deadline of 30 years old (in order to get the most out of their youth)- the majority of non celebrity Korean men enter the military after high school / college. Does Gary have a girlfriend? Ji Hyo…? No, unfortunately Ji Hyo is dating someone else right now. Gary did have a girlfriend of five years, he wrote a lot of the songs on the LeeSsang album Black Sun about their breakup. I have searched, and searched, and translated and I cannot find any reliable proof that Kang Gary has a special someone as of right now. But hey- you never know right? I just hope if there is a girlfriend the news stays hidden-because I like to live in my delusional fantasy world where the Monday couple is real and married. And before you remind me, yes I know hoping he keeps his love life quiet to keep fan’s hopes up is a really selfish thing to ask. But I can’t hear you because I am too busy looping MC clips. Lalalalala! Where does the nickname Yoomes Bond come from? 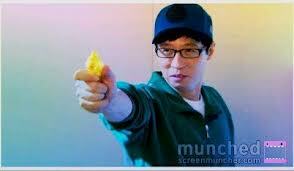 Yoomes Bond was born in episode 38, when Yoo Jae Suk was tasked with eliminating his fellow Running Man costars using a combination of stealth and a water gun. The premise was so well played Yoomes Bond usually makes at least one appearance a year. “I just hope if there is a girlfriend the news stays hidden-because I like to live in my delusional fantasy world where the Monday couple is real and married.” <— Are you me??? Hahaha! Have you watched Ep 149? I never knew I wanted MC Gary in my life, but now I realize I NEEEEED MC Gary to exist! I would so watch the Kang Gary Show! 😀 I loved how excited he got about it, and how the other guys were all hey he's doing well! In other news, KJK is scheduled to arrive in my country later today. I hope fans flood the airport for him! If MC Gary gets his own show I am a fan before the first episode airs! I loved his MCing, it was so over the top and endearing. I am jealous- KJK is going to be in your country! Daebak! Hey,, agree with your comment about Gary.. hehehe..
Hope he will be stays quiet even if he have girlfriend..
Oh,, and i’m wonder if Gary had completed his mandatory military service..
Hey! Kang Gary is 35, so it is a definite that he has completed his mandatory military service (unless he has a condition that would exempt him from service). Korean males are required to serve between 21 and 24 months, depending on the branch of the service they join. They are pretty much guaranteed to be drafted before they reach the age of 30. Since Gary is well above this age and a Korean citizen it is certain he either served or was exempted from serving. What could make a Korean Citizen exempted from military service? but that was when he was 34..
Have anybody watch Gary in come to play? he was awesome ( as well as bald ) lol..
You are correct, medical reasons can cause exemptions. Hullo fellow rm/MC fangirl; d ever wonderful n industrious Ms. Lore. it’s now 4.10 am in the morning kuala lumpur time. I’ve been telling myself ‘this would be the last post am gonna read, gotta clock in tomorrow for work’ since about 1ish just now. This site of urs are really a gem! Big , shiny gem just like the one Gary holding on for Ji Hyo in that Macao jewellery shop. Keep up girl! Am subscribing myself as ur loyal reader now 😉 bring on more MC pieces pls 😉 ehehehe. Kamsahamnida! Oh ya, wanna let u know the reason I’ve stumbled on ur site today is because I’m looking for bts/commentaries for ep 178. Not the rrcaps, more on how those cast reacted/felt after the superb challenge of crossing the han river on paperboard boat/makeshift raft. Do share if you found any pls. I really admire their will and teamwork for that challenge. Hi! Awww, gee thanks, I am so happy you enjoyed the posts and site! I don’t have any BTS commentary on ep 178, but I will definitely look for some and share if I find anything. I agree, their teamwork in that episode was extremely admirable. I really wish Monday couple to be a real couple. Who is Kang Gary Ex girlfriend 5 years love .? Sorryyy~ personally I’m not a big fan of the Monday couple… I like the Song-Song couple better, with song joong ki and song ji hyo…. kang gary lent his military service?